Comfort Suites Paradise Island is a family-friendly hotel offering all-suite accommodations within walking distance of the turquoise waters of Paradise Beach. 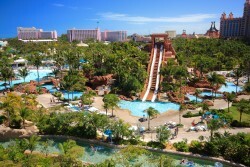 It is adjacent to the renowned Atlantis® Paradise Island resort and just a short drive from downtown Nassau. Guests of Comfort Suites Paradise Island have complete access to Atlantis amenities, including its five miles of magnificent beaches, 11 swimming pools, river rides and Aquaventure, a 141-acre water park. 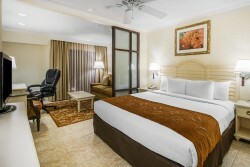 Why Stay at Comfort Suites Paradise Island? Atlantis Amenities — The attractions at Atlantis make it one of the most unique and exciting destinations in the Caribbean, and you have full access to them. Enjoy traditional water adventures like snorkeling and scuba diving, lounge on white-sand beaches, slip and slide at Aquaventure water park, hit the links at the Ocean Club Golf Course or meet the residents of Dolphin Cay, a world-class marine habitat. Fee applies for some activities. Complimentary Hot Breakfast — Start your day off right with a hot American buffet breakfast. It’s included! Delectable Dining — Dine on-site at Crusoe’s Restaurant, offering fresh tropical flavors like Abaco conch chowder plus sandwiches, wraps and salads. Or sample delicious cuisine from around the world at the many fine restaurants nearby at Marina Village, Atlantis and other hot spots on Paradise Island. Comfort Suites Paradise Island guests have signing privileges at the 21 restaurants and 19 bars and lounges at Atlantis. Junior Suites — Choose from newly renovated suites that accommodate up to four people, with either a king bed and sofabed or two double beds. All rooms have a mini-fridge. Complimentary WiFi & Parking — Keep connected with family and friends with WiFi in your room and public areas of the hotel. On-site parking is free, too! Bahamas Nightlife — Dance the night away at Atlantis’ Aura Nightclub, watch a movie at the Atlantis Theater, laugh out loud at Jokers Wild Comedy Club or have some high-rolling fun at the Atlantis Casino. Book Your Reservation Through Direct Exchange — It’s Easy! 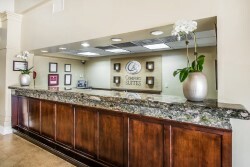 Book your Comfort Suites Paradise Island, Cambria Hotels or Ascend Hotel Collection stay using annual, biennial, borrowed or rented Points up to 100 days in advance of check-in. * You’ll get low exchange fees—even lower if you’re a Premier owner. ** Your Choice Privileges account number is required to book all Comfort Suites Paradise Island, Cambria Hotels or Ascend Hotel Collection reservations through Direct Exchange. * Reservations cannot be made for or on behalf of friends and family or any third parties. Before you make your first Comfort Suites Paradise Island, Cambria Hotels or Ascend Hotel Collection reservation through Direct Exchange, you must enroll in the Choice Privileges® rewards program. It’s simple and free! Enroll at bluegreenowner.com by clicking on the orange “sign up now” button and following the instructions. If you are already a Choice Privileges member, you can link you Choice Privileges number with your Bluegreen account at bluegreenowner.com by choosing the orange “link account” button. Go to bluegreenowner.com to Book Your Direct Exchange Reservation! Bluegreen Travel Services can book all your travel needs. Call us for airfare, hotels, cruises, tours, rental cars & more. Properties subject to availability. Properties are subject to change without notice. Pictures are for representation purposes only. Square Footage, furnishing and floors plans may vary for each unit depending on resort and accommodations type. Diagram is for representation purposes only. *Only Traveler Plus members with a Bluegreen Vacations ownership purchase date of July 1, 2006 or later are eligible for the Direct Exchange benefit. Reservations are subject to availability. To reserve the Comfort Suites Paradise Island, Cambria Hotels or Ascend Hotel Collection property through Direct Exchange, you must be a Choice Privileges member and link your member number to your Bluegreen account. Reservations may be made using annual, biennial, borrowed or rented Bluegreen Vacation Points. A reservation fee applies. Owners must be in good standing and current on all fees and dues to book a Direct Exchange reservation. Bluegreen Vacation Club owners and their guests are subject to the property rules of the individual hotel properties during their stay. Not valid in conjunction with any other offer. **Maximum Direct Exchange Fee is $69; maximum RCI exchange fee is $239; maximum Interval International exchange fee is $189. Direct exchange fee for Premier owners is based on ownership level: Platinum, $19 per reservation; Gold, $39 per reservation; Silver, $49 per reservation; Bronze, $59 per reservation. Bluegreen Vacations Unlimited, Inc. (Bluegreen) is the Official Vacation Ownership Provider of Choice Hotels International, Inc. (Choice). Choice is not a partner, joint venturer or an affiliate of Bluegreen, or of any of its affiliates and any inferences to the contrary shall be expressly negated. Choice Hotels, Choice Privileges, and the Choice Hotels logos and trademarks are owned and operated by Choice Hotels International, Inc. and are used with permission. All rights reserved. Great Vacation Destinations, Inc doing business as Bluegreen Travel Services, is located at 4960 Conference Way North Suite 100, Boca Raton, FL 33431. Great Vacation Destinations is an Iowa Seller of Travel No. 688, Washington Seller of Travel No. 602-283-711; Florida Airlines Reporting Corporation (ARC) registration No. 15-72225-4, California Seller of travel registration No. 2068362 (Registration as a Seller of Travel does not constitute approval by the State of California). Void where prohibited by law and where registration and/or licensing requirements have not been meet.